This is a complex topic covering approximately 40 years and several companies. Far too complex and to cover in any real depth there. What we will attempt to do here is a give a bit of a overview of this topic as it applies to the immediate East Liverpool area. For those who are interested in a more complete coverage we highly recommend the following book: Ghost Rails III Electrics. by Wayne A. Cole, Colebooks (2007). Steubenville East Liverpool and Beaver Valley Traction. (Source: Ghost Rails III Electrics By Wayne A. Cole. The local newspapers were relatively silent on the issue during the next month as politicians and businessmen maneuvered for position. Although it is not known what took place behind the scenes, it was not uncommon in other localities for a great deal of political manipulation and corruption, involving kickbacks and other influence-buying activities, to take place. In any case, the Cleveland group submitted a petition the first week of September stating that they had secured the right-of-way and were ready to begin construction. On 4 September 1891, city council enacted ordinances repealing the legislation granting the franchise to Armstrong and Knaver and authorizing the Johnson company to build and operate a streetcar line. The reason the Cleveland-based company was successful and the group consisting of the city's most prominent and influential leaders failed was never made public." News that the issue was finally settled after three years of debate, politicking, and controversy was greeted with joy and anticipation. Once the project was assured, the editor of the Review declared, "Hurrah for the Street Railway." Within days after the announcement, a demand for lots in the east end developed and property owners enjoyed a booming business despite substantial increases in property prices. Construction of the streetcar line progressed rapidly. 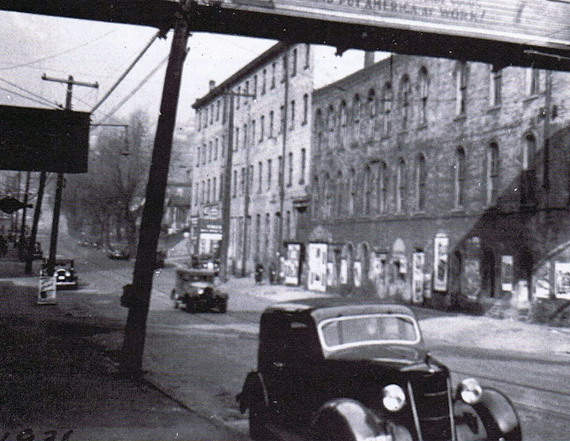 In early December several parties proposed that when East Liverpool and Wellsville were united by the transit system, the two cities should consider consolidating under one municipal government, forming a city of nearly thirty thousand people. The editor of the Review thought this plan would be advisable; however, the urban rivalries and local politics of the day made the idea unrealistic. 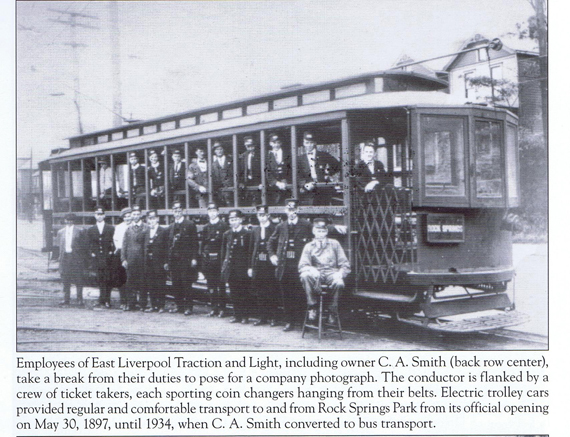 The official opening of the East Liverpool and Wellsville Electric Railway on 17 December 1891 was celebrated with a grand ceremony. The streetcars, of course, were an instant success. The Review reported that on 4 July 1903 over eleven thousand five-cent fares were paid and an additional four thousand children, who rode free of charge, were also passengers." The anticipated real estate boom in outlying areas, however, did not occur during the first half of the decade because of uncertain tariff legislation, economic problems on a national level, and the 1894 pottery strike. Following the uncertainty at mid-decade, the construction of new streetcar lines and the development of new sections of the city and its surrounding area proceeded at a remarkable pace. 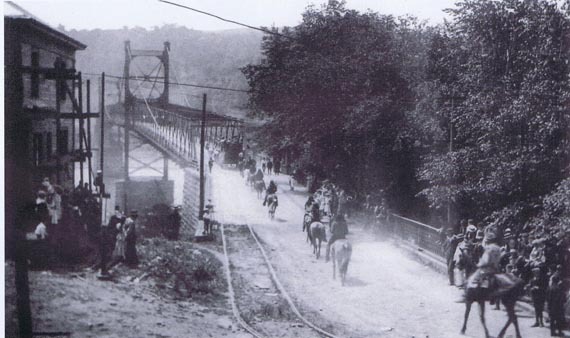 The construction of a bridge spanning the Ohio River between Ohio and West Virginia at East Liverpool was contemplated as early as 1889. The project was revived in 1893 by J.E. 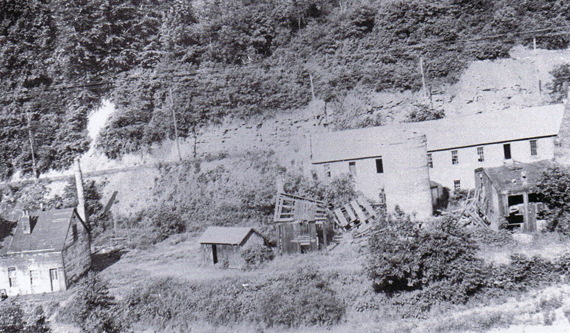 McDonald, an East Liverpool attorney who purchased the Marks farm across the Ohio River in West Virginia. 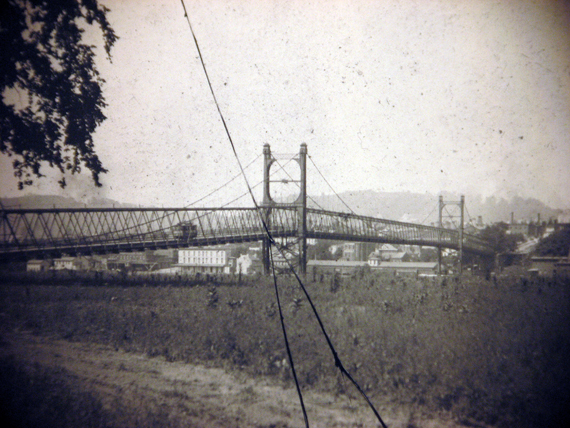 In April of 1893 McDonald announced that the East Liverpool Bridge Company, chartered in the State of West Virginia, had been organized to construct the bridge and that twenty thousand dollars in stock subscriptions had already been secured in Hancock County, West Virginia. 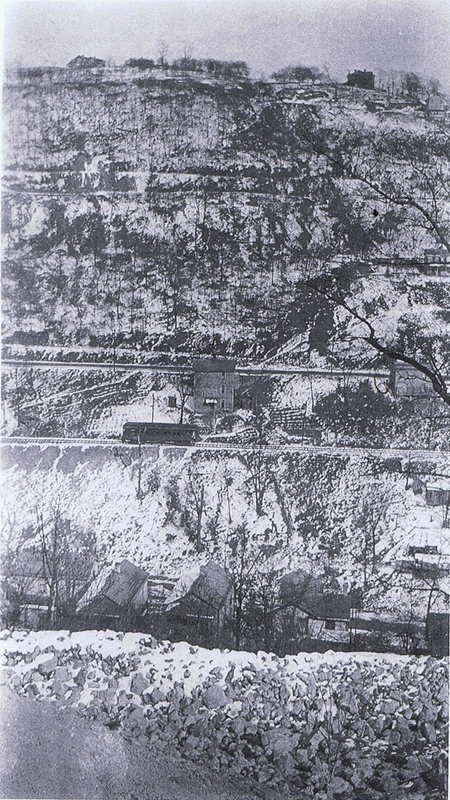 He hired engineers to survey the area for the best location of the bridge and began to solicit subscriptions in East Liverpool for the balance of the stock. The editor of the Crisis was excited about the prospect of the bridge, citing the deficiencies of depending on ferry service and describing the benefits to the city and the area across the river. The project was temporarily abandoned because of the Panic of 1893. Three years later, in January 1896, the plan was revived and construction began. By this time the city council had authorized the company to locate the entrance to the bridge on city property and it had been secured by the company, which consisted of McDonald, W.L. Smith, A.R. Mackall, other local capitalists, and J.G. Kerny of Montreal." McDonald and his associates also formed the Chester Land Company to develop the 475 acres of land they owned. 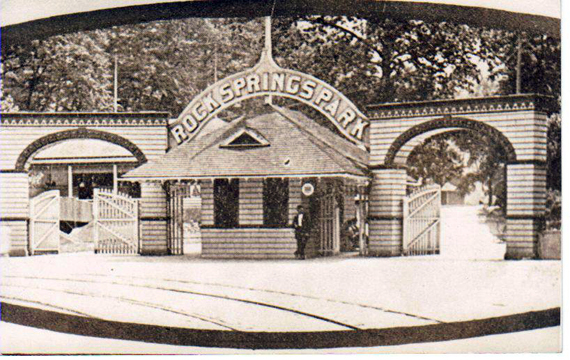 This land included Rock Springs Park, which they planned to enlarge and develop as a resort. Additionally, the investors intended to connect the "Crockery City" with their new town by a street railway across the bridge. Looking from the Chester side towards East Liverpool. Picture taken of a picture found in the Travelers Hotel. In the meantime McDonald and his associates began making arrangements for a streetcar line to traverse the new bridge and make their new town more accessible. 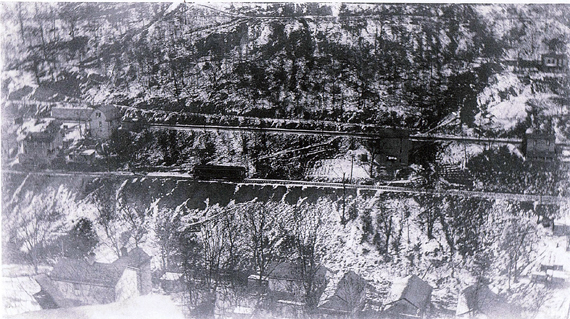 A dispute over the new line developed between McDonald and East Liverpool officials. Under the terms of McDonald's original proposal, the new line to the Pennsylvania state boundary. Alex G. Chaffin platted a new suburb west of Pennsylvania Avenue and built several houses in 1900. The Supplee Land Company was formed in March 1901 and purchased a tract containing about twenty-one acres which it platted into residential lots. The Island Avenue Land Company platted 169 lots east of Sebring's Klondyke pottery in May 1902 and sold them for prices ranging from fifty dollars to $250. In November 1902 the Midway Land Company began developing a residential area between the central city and the east end along Pennsylvania Avenue. 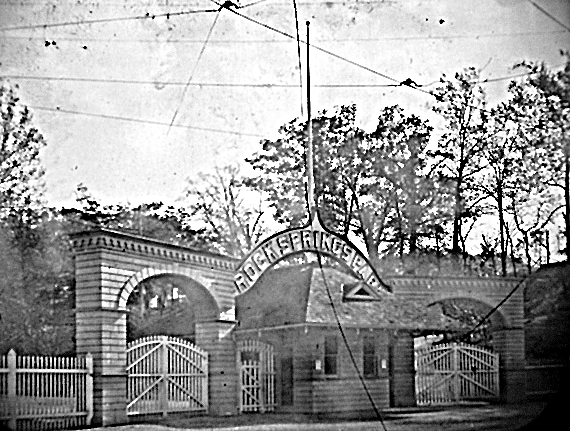 The Cleveland and Pittsburgh Railroad Company announced in January 1902 that it planned to build a depot and freight station in the east end at a point opposite the National pottery. Pottery manufacturers and residents alike hailed the news. The editor of the Crisis, citing the number of new merchants and residents, stated in the fall of 1902 that the east end was enjoying an era of business prosperity. The only thing holding the suburb back, he added, was the lack of houses, although they were rapidly being built.'8. THe City of Hills and Kilns, pp 184-190. 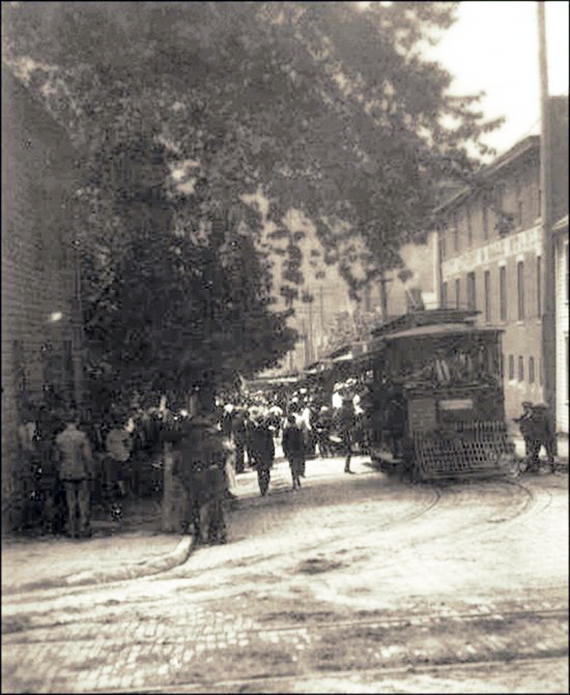 Trolleys lined up on Union Street between East Second Street and East Third Street either taking on passengers for a day at Rocks Springs Park or discharging passengers after a day at Rock Springs Park. The time period is probably late 1890s or early 1900s. 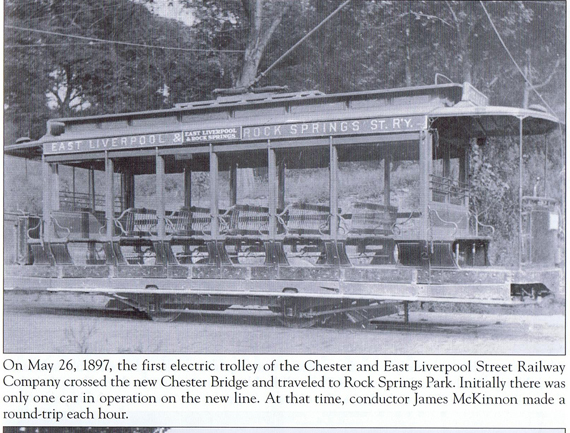 The Chester and Rock Springs Railway Company/East Liverpool and Rock Springs Railway operated from 1897 to 1905. 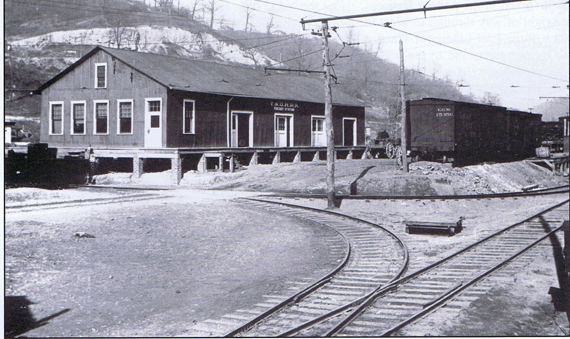 It was absorbed by the East Liverpool Traction and Light in 1905. (Ghost Rails III Electrics by Wayne A. Cole. 2007 p. 164. 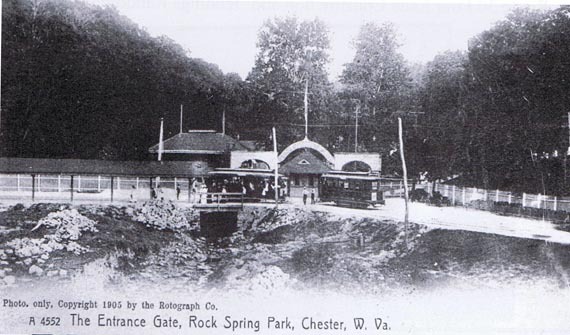 Entrance to Rock Springs Park. 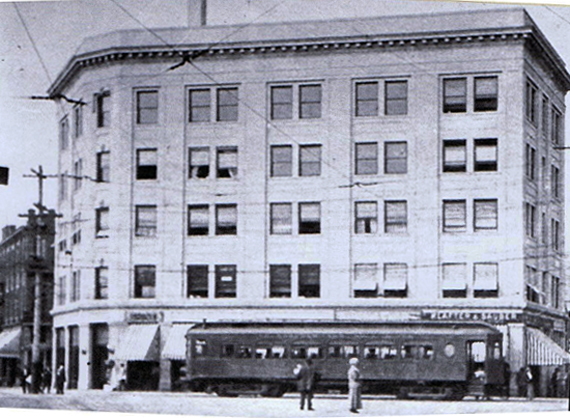 Notice the trolley wires. A slightly different angle, you can see trolley tracks. 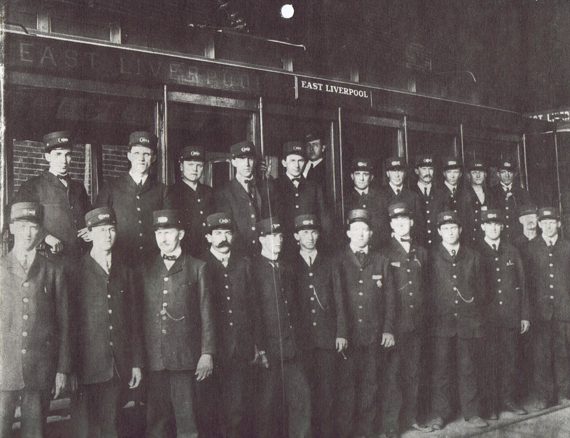 Employees of the East Liverpool & Rock Springs Park Street Car Company in 1911. Sunday Nov. 12, 1911, 4:30. Just a brief overview. This Railroad existed from approximately 1905 to 1931. It has it's roots in a act of the Ohio Legislature of 1832. One that proposed a railroad from Lake Erie to the Ohio River. Over the years there were a number of "paper" railroads, ones that were written up but never became a physical reality, or small portions of a railroads that fit in what could be considered portions of that big lake Erie to Ohio River dream. Our interest here is that portion of a railroad that actually did exist from Salem to East Liverpool. To be exact that portion of that line from the East Liverpool Road to California Hollow (Carpenter's Run) the West 9th Street area to Dresden Ave to the Diamond. 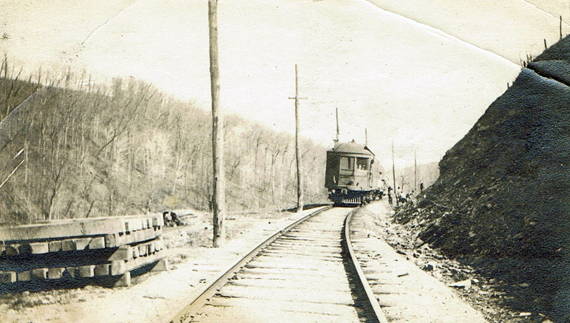 March 1907, a Y&O along California hollow headed towards East Liverpool. 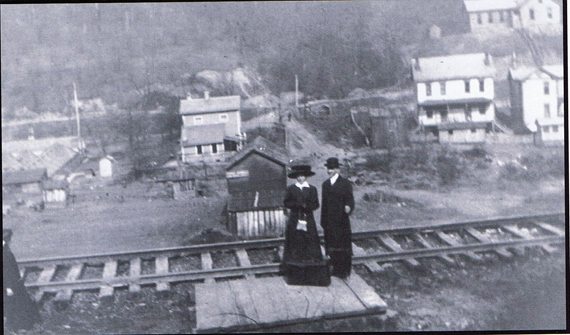 Arthur Hall and his wife, the former May Brookes, waiting on a Y&O car arrival. Brookes Family pictures. A trolley car making its way down California Hollow. Picture courtesy of Timothy Brookes. 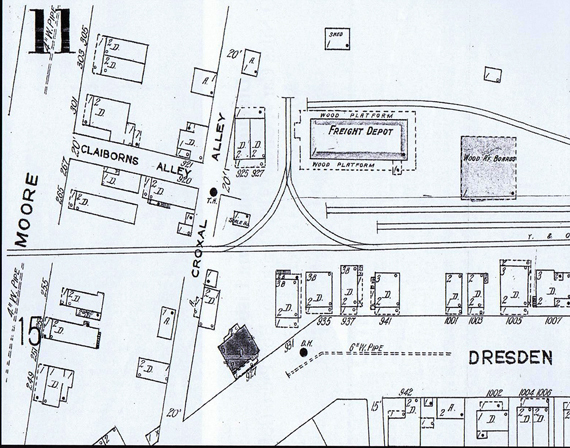 Sanford Fire Insurance Map showing the location of the East Liverpool Y&O Freight House. From West 9th Street the Y&O, by agreement, used the East Liverpool Train & Light tracks up Dresden Ave into the diamond. (Ghost Rails III Electrics, by Wayne A. Cole).